2018 will be my first year as your President and I would like to start by wishing you all a Peaceful New Year. It is destined to be a busy and fulfilling year in which I hope you will all participate. 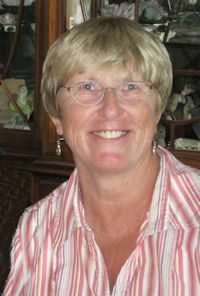 Our wonderful past President, Mary Latham, has started several actions that I would, with your help, like to complete. 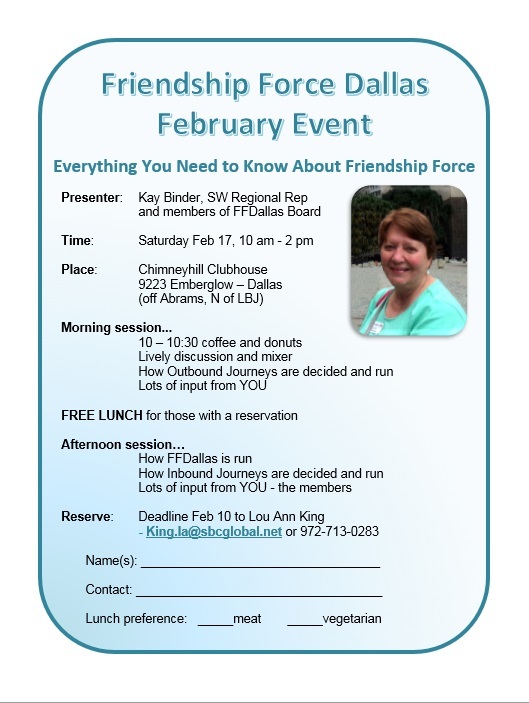 In February we have Kay Binder, our SW regional rep, coming to Dallas from Austin. We plan to have a fun day of leadership/journey director training. We are very lucky to have Kay come and I hope we have a great turnout. 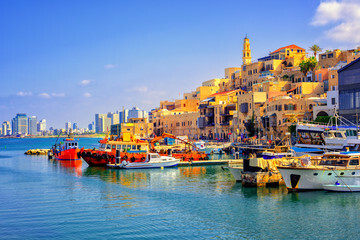 In March we have a 2 week Journey to Australia, in August we have been invited to Reno/Tahoe for a 1 week Journey and in October we have a 2 week Journey to Israel. 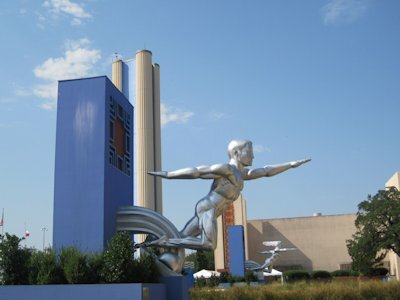 May finds us hosting a 1 week Global Journey to Dallas showing the ambassadors the wonderful Art and Architecture of Dallas. Finally in September we will host people from Brazil. As you can see we have a busy year ahead and, with all our members helping, it will be a great one. I think we are lucky that FFI has given us many Journeys. Plan to see you January 13th when Sandy Kaiser plans to tell us about her FF trip to Kyoto Japan. FREE LUNCH for those with a reservation - BBQ meal - with vegetarian beans, cole slaw, broccoli salad and cobbler. 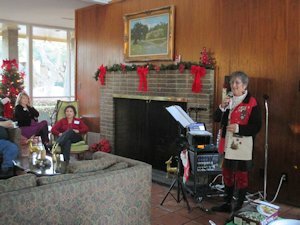 We celebrated our annual Holiday party with welcome return visits from Dora and Ed Stahl and Marge and Ed Edgren. 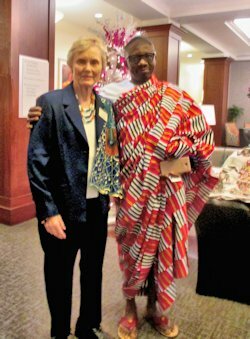 We, also, were honoured with a visit from Isaac Teye who is VP of the Volta Lake club in Ghana, here on a private visit arranged by a request for hosting through FFI. His club is interested in inviting us to visit them along with a ossible Journey to Capetown's Cape of Good Hope Club. A beautiful music programme was presented by Trixie Trincher. Lou Ann King, Journey coordinator for this Journey to Gold Coast and Sydney, says the trip is a GO and asks that the ambassadors check their email every day. She will be sending out insurance, flight and money request information now that she has a firm plan. 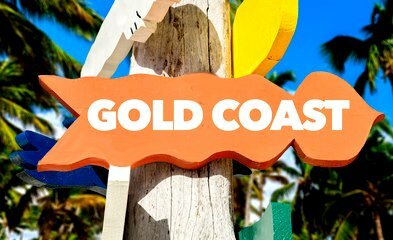 It leaves on March 5 with a stayover in Sydney on March 7 for a jet-lag break, and on to Gold Coast on the 8th. 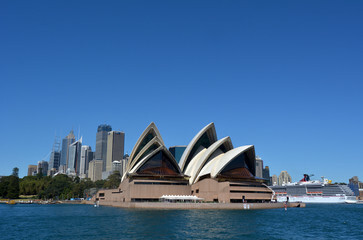 The Sydney portion is form March 15-21. The Journey is fully subscribed but there is a waiting list. Our international Inbound Journey for 2018 will be the ART AND ARCHITECTURE GLOBAL JOURNEY scheduled for May 15th – 22nd, 2018. The Host Coordinator is Felicity Sentance. This special Journey needs a lot of participation but will give us a chance to go to places and do activities with the visitors that we rarely have done on our usual club-to-club Journeys. We will be needing home hosts, day hosts and many other positions, since there is no Ambassador Coordinator from another club necessitating our dealing with all the applications and screening usually done by the Ambassador coordinator. if you’d like to be involved ………. She’d love to have your help. Reno-Tahoe outbound dates are set: Aug 14-21. Reno can host a minimum 12 and a maximum of 16 ambassadors. Julia Cooper has been appointed Ambassador Coordinator - acjc1804@hotmail.com. To volunteer to be a Host or Ambassador Coordinator or Co-Coordinator for a Journey, please contact Patty Niemeyer - peanutpatti1@gmail.com or or Ray Enstam enstam@sbcglobal.net. If you have not been a Coordinator before, give it a try. You will get lots of help and training. 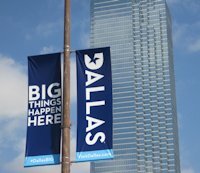 UPDATE: Information session in Dallas February 17, 2018 as our February Event. Keep in mind that there are some financial incentives. These Ambassador and Host Coordinators are eligible for reimbursement for at least some of their costs. See the Club Policies on page 37 of the Yearbook for 2017. Please let our president Mary Latham know if you plan to go. 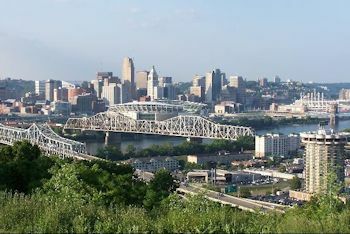 The Cincinnati Club would like to have an idea of how many are coming. The next Board meeting will be Monday, 15th, at 1 pm at Julia Cooper’s house. All members are welcome to attend. Send any changes of address or email to edward perez who manages our database - erperez@acm.org . When you receive changes, please update your yearbook and email list. FFI has published new Journey Guideline and edward perez, Lou Ann King and Patty Niemeyer are working on recommendations for the use/allocation of funds for our Domestic Inbound Journeys and dealing with budget deficits on Inbounds. Where do you want to go in 2019? The Board decided to put in request for Taiwan and Japan as one Journey and Cape of Good Hope as the other. Ray Enstam, our International Journey Coordinator-in-Chief, should hear back from FFI in January or early February, 2018 as to our assignments. Lee Latham is continuing with his treatment.Cathy Ignatin has recovered from pneumonia which was complicated by having a full renovation of her kitchen. 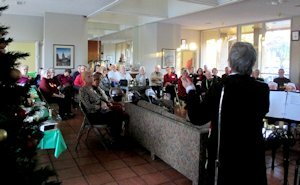 Saturday February 10, 2018 at Chimneyhill Clubhouse. Kay Binder, our Field Rep from Austin will be presenting it. See February Event above. Journey Coordinator Training webinars - We've had approximately 130 people take advantage of the online trainings that have been offered so far. Kay also presented Everything Google Training webinar about how to use Google products to coordinate Club and Journey Events. We will let you know when more will be offered. FFI has introduced ‘Photography Club Clusters’ and spoke about it in their latest e-newsletter which you should have received if you’re on their mailing list. Mary Latham is asking anyone who is interested in forming a group to contact her as she is an avid photographer. 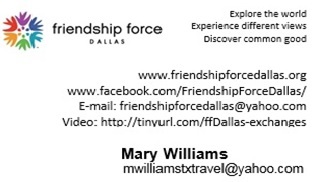 Contact her at: mary_m_latham@yahoo.com. FFI has introduced ‘Photography Club Clusters’ and spoke about it in their latest e-newsletter which you should have received if you’re on their mailing list. Mary has a group forming and invites you to join them. This group is for anyone of any skill level – from those who use their phone to take photos to those who use digital cameras.